I turned in the manuscript for the next Darkover novel, working title The Laran Gambit (although that will change). I’ll let you know when I have a pub date for it. I’m working on the next Darkover novel, Arilinn, about the founding of that legendary Tower. I’ll be posting snippets through my newsletter. You can subscribe to it here. I’m also preparing a collection of my Darkover short stories A Heat Wave in the Hellers and Other Tales of Darkover(R). It includes my stories in the various anthologies plus a few bonus stories, including one I wrote for Marion as a birthday gift (and has never before been published). The release date for print and ebook editions will likely be this fall. Stay tuned for more details! The best way to keep up on my news is through myblog here. Every week I offer author interviews, book reviews, science articles, and beautiful paintings. 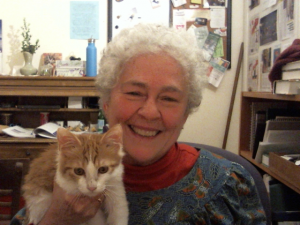 Deborah with Sonja, one of two new feline family members.